This player is coming into his peak years and his club have already secured his services on a long contract. This is a winning situation, right? 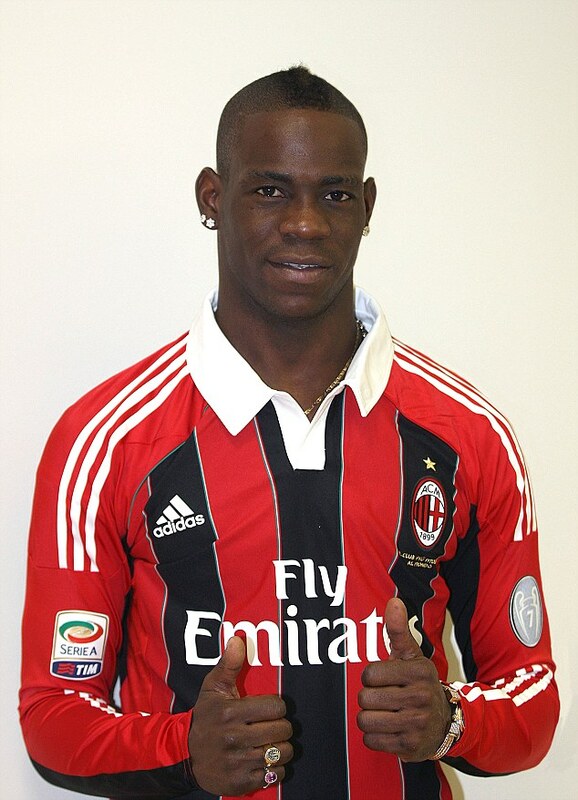 Mario Balotelli is a player that divides opinion. Some see him as surly, self-interested and wasteful whilst others are less positive. To me he represents some of what makes football entertaining and despite a litany of craziness that embodied his younger days, there is a fair chance that he is embarking upon the peak years of his career with a subtle change in his attitude. The tabloid headlines have become less frequent, there is greater consistency in his hairstyle and maybe, Super Mario has grown up. Sadly for him, he’s coming off the most underwhelming season of his career. Never entrusted with a regular starting spot by Brendan Rodgers, he played bit and bobs minutes all year and only registered one league goal. So what happened last season? He’s not suddenly a bad player, is he? Ok, so we now have a list of leaden booted types. Each is characterised by a truly miserable raw all shot conversion rate with none exceeding 5% this last year. Fascinatingly, Balotelli’s under-performance is nearly twice that of Cazorla, it’s a freakish outlier but, as ever, he’s taking a ton of shots and getting a solid amount of them on target. Anyway, are these players prone to such seasons; are they genuinely bad shooters? A few of these players appear to be regularly sub-par, and that may well be a function of shot selection, Kranjcar instantly comes to mind as a player who takes a lot of shots from range and my memory of Navas is of him on the right byline, so understandably goals may be in short supply from there too. Amusingly, given their periodic reputation for shrewd usage of the French market, it appears Newcastle made a classic faux-pas in purchasing Riviere off the back of an overachieving season and he promptly headed towards balancing things out. That Cabella forgot where the goal was too seems more in the realm of misfortune. 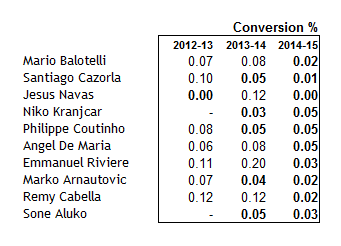 Cazorla and Coutinho had solid creative seasons and gained many plaudits but have each spent the last two seasons as high volume, low conversion shooters, which is an aspect of their game that a coach might well note. Along that line, shot volumes of certain players increase by their taking a large amount of low expectation range shots. This can surely only be achieved by the least compliant and thick skinned player. Mario fits into this category well, but i’d posit that it’s an irregular role for others. Team dynamics and coach orders are usually effective in minimising the volume of wild shots within a team. We’ve all witnessed an early “sighter” fly towards the upper tiers early in a match accompanied by a wave of acknowledgement from a player who is well aware he’ll be given less grace if he tries similar again. Significantly good from close in, usually, and broadly par around the rest of the pitch. Worth noting here is despite the regular wild potshots, his long term conversion rate here seems just fine. And a total washout for 2014-15. 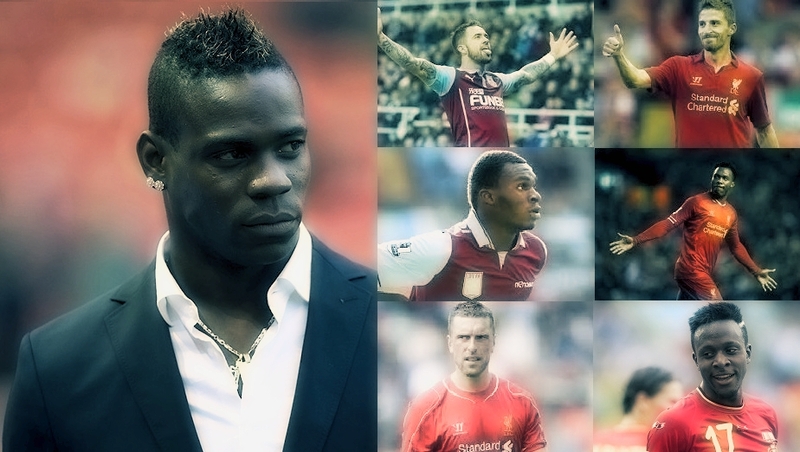 Liverpool fans have not seen Balotelli’s best. 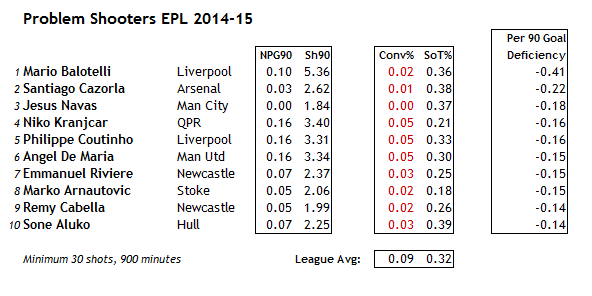 Conversion is a noisy measure and fluctates regularly; and it can affect even the best, as noted this last season by Michael Caley, Sergio Aguero ran at one goal in around 50 shots during Man City’s mid season slump. So the fundamental takeaway here is that Balotelli’s shot volume (always high) and his history suggest he is capable and likely to contribute a higher goal tally next year. Liverpool striking corps received it’s first new addition today in the form of Danny Ings, a promising player, yet only a couple of years younger than Balotelli and fresh from (under)powering a relegated attack. I suspect many will perceive his role as number two behind or alongside Sturridge, but with a haul of ten non-penalty goals and four assists last season coming out at about par for expectation based on shot and shot assist numbers, it’s hard to see how he tangibly improves Liverpool’s attack. With Lambert 33 and coming off a season as untrusted and sporadic as Mario and Borini surely moving on, there are vacancies around the squad, for all that we have no idea what kind of strikerless 3-4-3 Liverpool may play. Or it could end up completely different, such is Brendan’s way. To my mind the Sterling behind Sturridge and Balotelli idea they used in dismantling Tottenham early last year was a solid blueprint that was discarded as Sturridge headed to the treatment room. As ever his fitness will be key. And that’s partly the reason retaining and empowering Balotelli makes sense, he’s as close as Liverpool will likely find to a Sturridge plug and play replacement in any given system, and it makes sense to plan for that. What of Divock Origi? Two shots per game and one goal every four matches in Ligue One does not scream “breakout star” either. To me, both he and Ings look more like options for mid-table sides opposed to Champions League contenders. Benteke has been mooted in parts, and it would likely spell curtains for Balotelli if so, but both he and Ings are ballpark three shots per game players, a significant drop on Balotelli or Sturridge’s five. You clearly get an aerial masterclass from Benteke but is that in Liverpool’s methodology with Sterling and Coutinho still likely to be buzzing around nearby playing intricately? None of Liverpool’s forwards played over 1000 minutes in the league last season, which was a bizarre blend of injury, formations and trust issues. What is certain looking towards 2015-16 is that a degree of forward consistency both in style and personnel would likely assist Liverpool’s cause. One presumes that Balotelli’s all round contribution hasn’t impressed Rodgers but in any system requiring a pure forward, Balotelli is clear second best behind only Sturridge. Rodgers has little time left for experimentation and may need to start non-typically fast and be in contention early on.